After months of anticipation, the iPhone 6 is finally official… along with a bunch of other stuff! Here’s a recap of the highlights from Apple’s event today in Cupertino in case you were having some technical problems with the livestream. For full details, check out the link(s) below each highlight. The first thing we all noticed on the 4.7-inch iPhone 6 is the rounded edges with a camera lens that sticks out of the body. 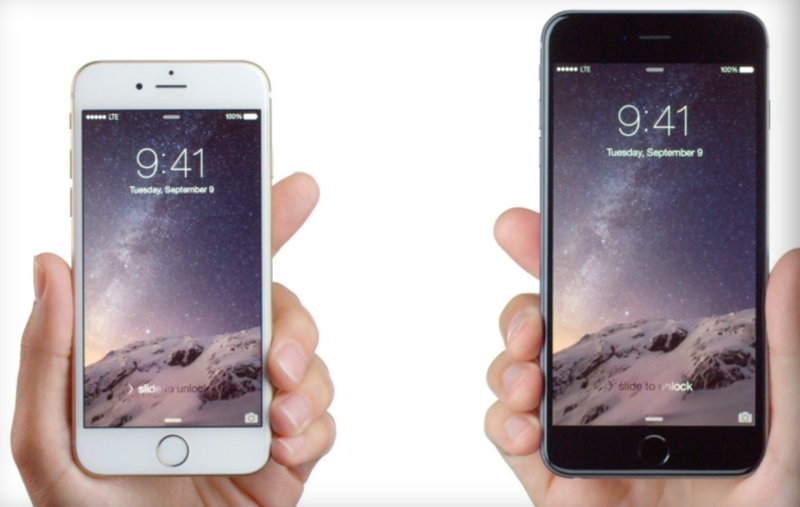 Apple also announced the iPhone 6 Plus which has an extra large screen at 5.5-inch. Both models feature Retina HD screen; The 6 is 6.8mm thin while the 6 Plus is 7.1mm, and are both powered by a 64-bit A8 chip to offer up to 25 percent faster CPU and 5 percent faster graphics, Apple says. 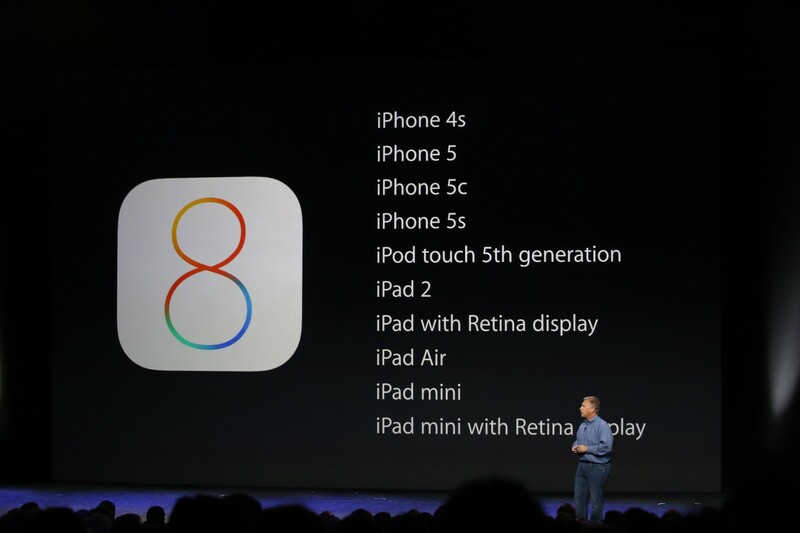 Of course, both will come on iOS 8. Supported devices will receive their update on September 17. The iPhone 6 Plus can also be used in like a mini-mini-mini iPad in horizontal view; the home screen will automatically convert to landscape alignment when tilted sideways. Also included is the M8 processor that’s extra sensitive to tell the difference between cycling and running, and can measure distance and elevation using a barometer. The 6 now has 20 LTE bands, allowing for more LTE roaming and Wi-Fi calls. New camera specs include an 8MP iSight camera, True Tone flash, 1.5 micron pixels, f/2.2 aperture and an all new sensor for bigger panoramas that expand up to 43 megapixels. The new camera can also shoot 1080p videos at 30 fps and 60 fps with continuous auto-focus; slo-mo vids shoot at 120 and 240 fps. The front-facing cam offers a burst mode and single shot HDR and HDR videos. 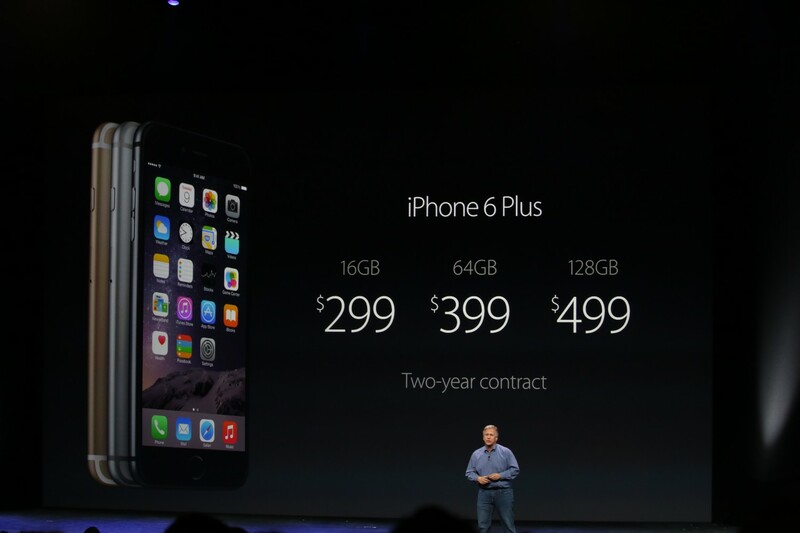 The iPhone 6 starts at $199 for 16GB; the 6 Plus starts at $299. Both ship on September 19, pre-orders starting on September 12. Apple also confirmed that App Store now offers 1.3 million apps, up from 1.2 million figure announced back in June at WWDC. 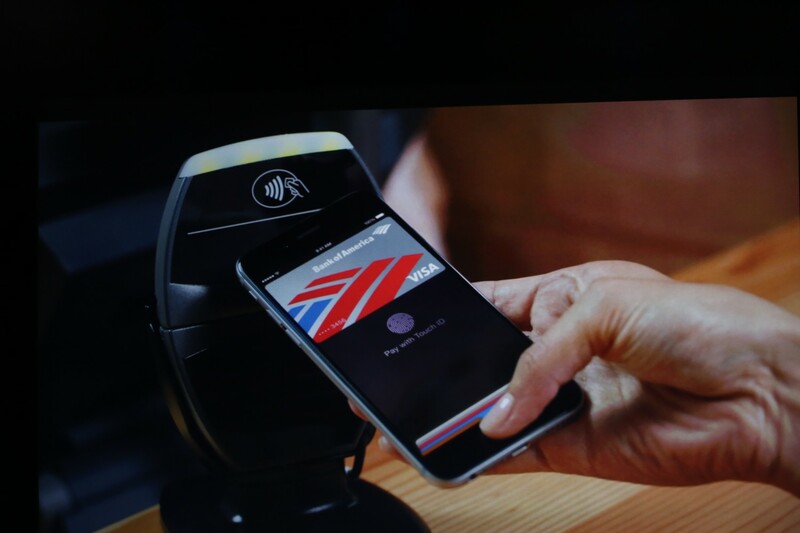 Apple has announced a new “payment process” called Apple Pay that uses NFC and Touch ID to confirm purchases. Users can browse through their credit cards using Passbook after verifying their card with their bank. Apple Pay creates a one-time device-only number instead of using the assigned credit card number so if your phone is stolen, you can suspend the payments without needing to cancel your credit card. Apple Pay will launch first on Visa, Mastercard and American Express. Supported retailers include Apple (of course), Disney, McDonald’s, Whole Foods, and online merchants like Uber and Groupon with one-touch payment. Apple Pay will come to iOS 8 devices in October. The much-rumored Apple Watch is official. Tim Cook says it is accurate within plus or minus 50 milliseconds, and comes with various customizable options, with six types of strap and two metal frame colors. Apple has added a navigational tool called a “digital crown” which is the dial (normally found on traditional watches to adjust time) to zoom or scroll. The digital crown also acts as a home button when pressed to return or exit out of apps. The screen is still touch-enabled to swipe through the screens of an app or draw. It can also recognize between taps and clicks by detecting force. Apple Watch comes with Siri, shareable heartbeat and animated and customizable emojis. The watch also works as a “comprehensive health and fitness device” with its equipped heart monitor, gyroscope and accelerometer. It comes with a three-ring activity monitoring system to remind and encourage the wearer to be more active to reach daily goals. 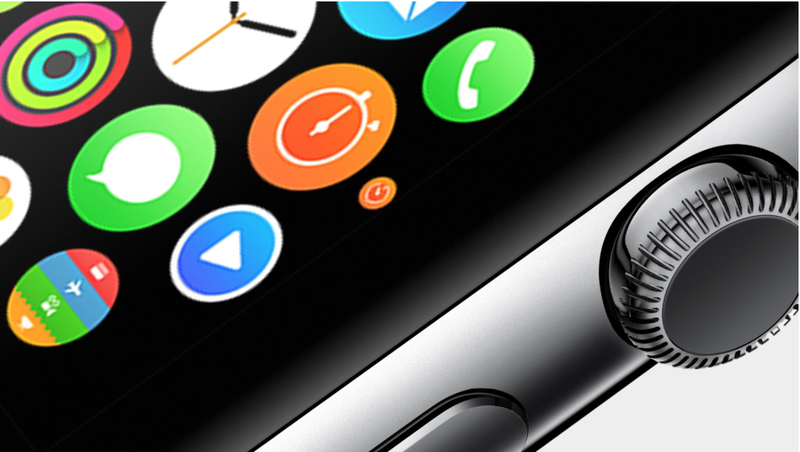 Apple will open the WatchKit SDK for third-party developers to create functionalities on the Apple Watch. Upcoming third-party features include tapping to check in to an American Airlines flight, tapping or waving the clock to unlock your room at SPG hotels and Nest thermostat control from the watch. The Apple Watch will come in three collections: the original Watch, Watch Sports, a 18k gold Apple Watch Edition. It will be available in two screen and band sizes. It is designed to work with iPhone 5, 5s and 5c, in addition to the 6 and 6 Plus. Apple Watch will come with Apple Pay equipped. 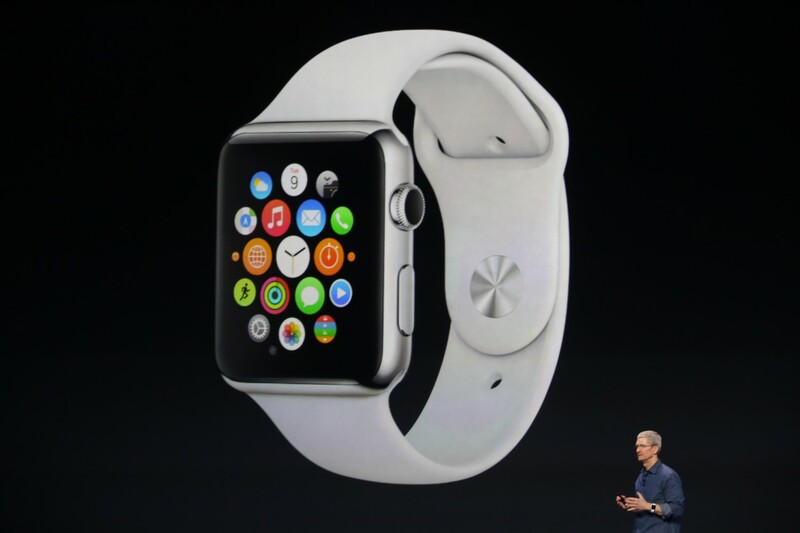 The watch starts at $349 and will be available in early 2015. No details on battery life just yet. Tim Cook ends the event by declaring its love and involvement in music, citing the ongoing iTunes Festival and growing iTunes offering. 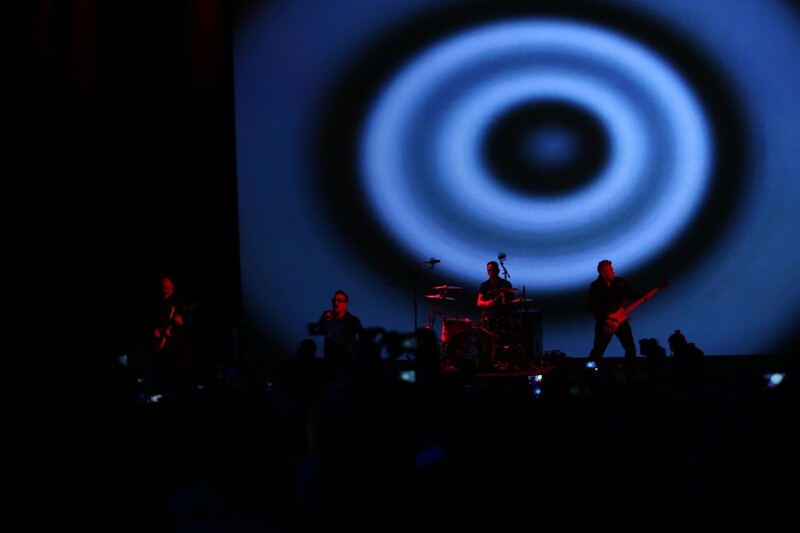 He then introduced U2 to perform on stage and gave out the band’s newest album for free on iTunes (offer lasts until mid-October).